Prior to purchasing these home brew fermenters I tended to use glass carboys but would also use a plastic carboy on occasion. Often times I get asked if they are worth the money? For me I can quickly and honestly answer yes! The main reason is they are more durable and I do not have to worry about dropping one of my glass carboys anymore and having it send me to the hospital. I also got them for a great deal, or at least what I consider a great deal. I picked the stainless steel brew buckets up for $195 each, the 7 gallon for $395, and the 14 gallon for $495. There are a few more reasons why I like them so much. They are constructed from 100% stainless steel, so if I care for them they will last a life time. Since these homebrew fermenters are built from metal, it also means that I do not need to worry about light oxidization while the wort or beer is in it. They are incredible easy to clean. If I want to I can transfer via CO2 pressure. My 14 gallon unit has a temperature control unit which makes fermenting an ale or a lager a breeze regardless of the time of year. My stainless brew buckets and 7 gallon conical fermenter all fit in my fermentation fridge and allow me to ferment about 18 gallons of beer as opposed to 10 gallons if I was still using my glass carboys! Dry hopping these are a snap since their lids come off, which make they a snap to clean as well. The conicals come with a thermowell built in and the stainless brewbuckets have a add-on kit for them as well; that makes monitoring temperature easy if you have a temp controller and fermentation chamber since it give you an actual temperature reading of the fermenting beer as opposed to the outside of the fermenter or ambient chamber temp which may be off by several degrees. As you can see, filling the conical is as easy as it gets. It even has easy to read gallon markers etched into the inside wall of the fermenter. As you can see there are two ports on it. One for dumping large volumes from the base of the conical or harvesting yeast (which is simple and can save you some money) and a second transfer and tracking arm port for siphoning beer above the sediment and or yeast bed. Transferring beer from the stainless steel home brewing brew bucket fermenter. 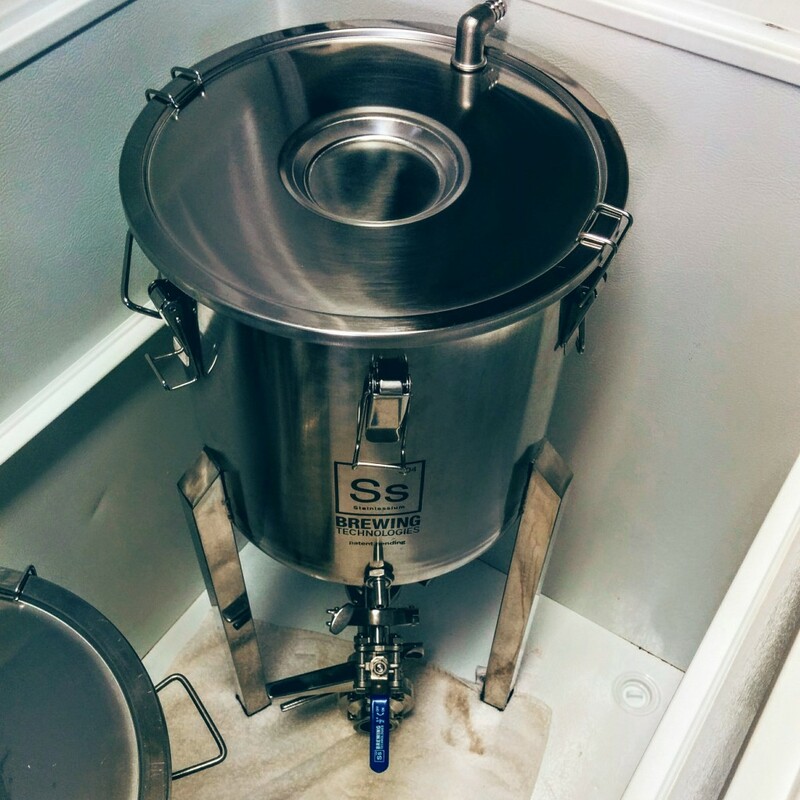 As you can see in the above photo, transferring beer from the stainless steel brew bucket is about as easy as it gets. It has a single port and rotating internal racking arm that makes transferring clear beer to the keg as easy as turning a valve. 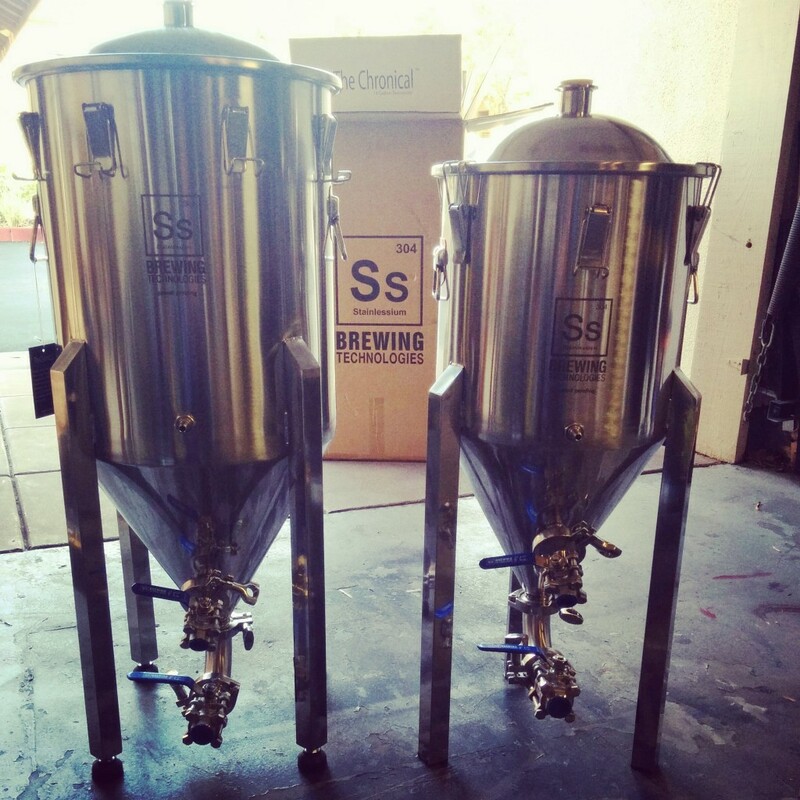 No more sanitizing siphons with these fermenters. Having less things to worry about or to clean is always a plus when it comes to home brewing. As I had mentioned earlier, cleaning these fermenters in very easy. I simply use some PBW, warm water and a nylon scrub sponge. The lid comes off so it is easy to reach everything and the conical fermenters come with sanitary clamps so they break down and reassemble effortlessly. I have used these fermenters for over 3 years now and still do not have one complaint about them! If you are interested in picking one up, here are the links and best of all, they are shipped free! The above listed stainless brewbucket is currently on a promotional deal. It regularly sells for $225, so if you were looking to purchase one then now may be a great time! Recently I had purchase a 7 gallon stainless steel conical fermenter and was in heaven until I realized that it did not fit in my converted chest freezer / fermentation chamber! So you know what that means; time to grab the cut saw and go all A-Team on the conical fermenter. In the above photo, the stainless steel conical fermenter on the right is the 7 gallon unit that I am converting to fit into the chest freezer. I am adding a temperature control unit to the stainless steel conical fermenter on the left and will cover that project in a future blog. So to start, I had to replace the lid on fermenter with the lid from one of my stainless steel brew buckets. Because the stainless steel brew bucket lid is flat, it saved me a few inches and let me connect a stainless steel elbow pipe fitting so that I can use a blow-off tube as opposed to an airlock which save me another couple of inches. With those simple modifications, I was just about there. Next I measured the clearance space from the lower valve to the floor and I had approximately 4 inches of clearance. So I trimmed each leg down approximately 3 inches as you can see in the photo at the top of the page. The modifications to my stainless conical fermenter worked perfectly and now it easily fits in my chest freezer and I am once again a happy man. You can see the photo below. If all goes well, I will brew my first batch with this fermenter this weekend and will let you guys know how it goes, but so far I have been very happy with the quality. I gave it a good cleaning and there were no leaks, all of the welds are perfect and the valves and fittings are all very high quality. If you are looking to purchase one, they are currently available for just $395! I have good news for my fellow home brewers. 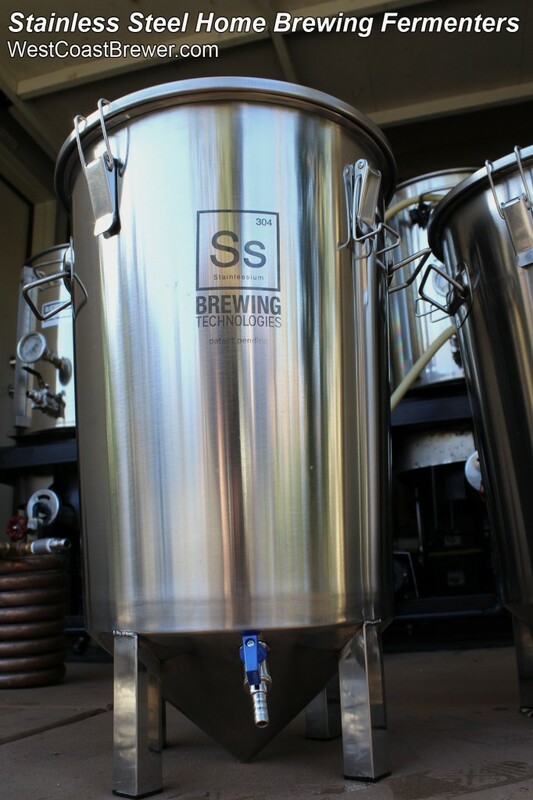 If you have always wanted a stainless steel fermentor for your home brewing setup but have been scared away from making the purchase by either the cost or the size than this might be the fermentor for you. Last month MoreBeer.com released these new 7 gallon stainless steel conical fermentors and I picked up 2 of them. They currently retail for $225. 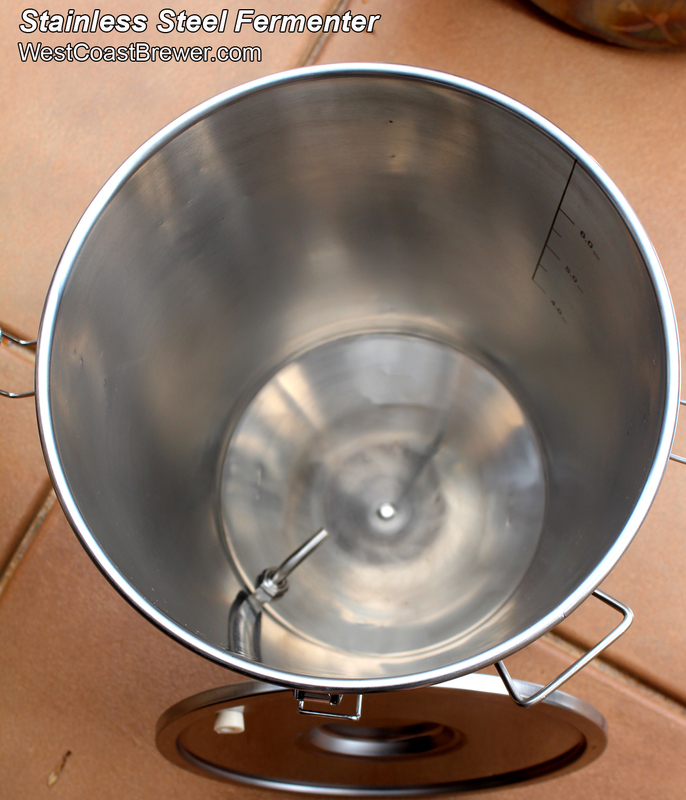 There are several things that I like about these stainless steel fermentation buckets. 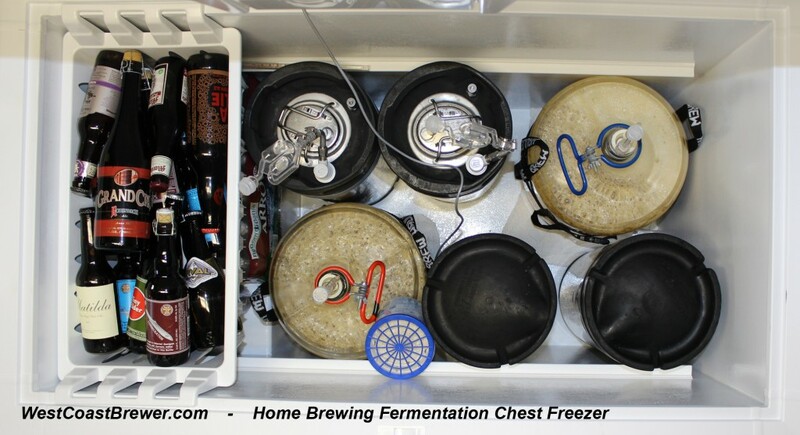 First off is that they are small enough where the still fit in the chest freezer that I use as a fermentation chamber. Secondly, they have strong handles on the side that permit you to carry and move them around when they are full. Something that would be far more tricky with a larger 14 gallon conical stainless steel fermentor. Another thing that is great is that they have volume markers engraved into the side of the fermentor which is awesome! Perhaps the best thing about this stainless steel fermentor is that it wont crack, chip, break or possibly shatter if you drop it and embed large shards of glass into your leg! In most cases this will also make the need for a racking cane obsolete. It is also larger than standard carboys! 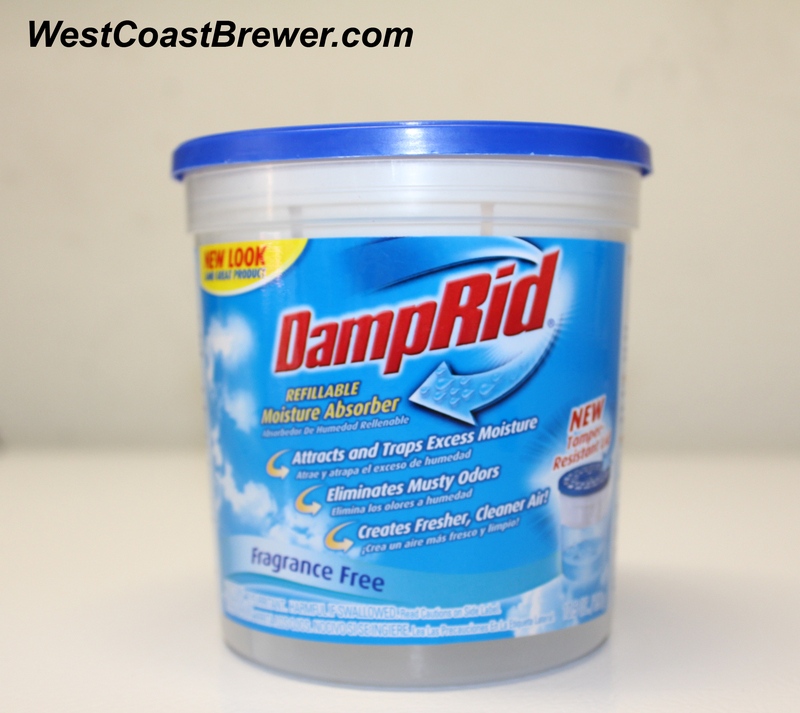 With its plus sized 6.95 gallon capacity you wont have to worry much about head space during high krausen on a 5 gallon batch. Lastly what I like about it is that it is far easier to scrub than a carboy since the large lid comes off so that you have full access to the inside of the fermentor. Honestly about the only thing about a carboy that I miss is being able to watch the fermentation take place. It would also have been nice to have another valve on the very bottom so that you could remove trub or harvest yeast from the fermentor. Those two points aside, if you are looking to purchase a reasonably priced, high quality stainless steel fermentor or stainless steel brew bucket as they call this, than this is a great choice. The Johnson Controls digital temperature controller can be used for a variety of home brewing functions. You can use it to keep an exact temperature in your kegerator, keezer, fermentation refrigerator or freezer, or it can be used to activate a heating element such as a heating pad to increase temperatures if needed. 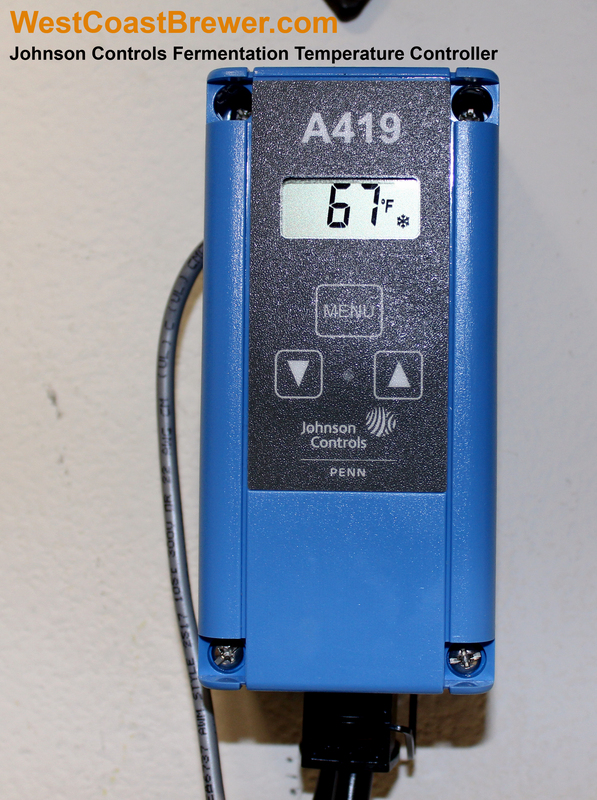 I have my Johnson Controls Digital Temperature Controller hooked up to my fermentation freezer. It comes fitted with a wired temperature sensor that I attach to the side of my carboy or secondary fermentation keg. I insulate the side of the temperature sensor that is exposed to the air with some foam insulator and tape it to the side of the fermenter so that I can get as precise of a temperature reading as possible. There are also thermowells available that allow you can get an exact temperature reading of the inside of the fermenter. One of the things that I like most about the Johnson Controls Digital Thermostat is that it allows you to set a temperature variance and a anti-short cycle delay. This comes in handy as a method for preventing the compressor on my freezer from constantly turning on and off, which could cause damage to it over time. I have it set to keep the temperature of my freezer within a 2 degree variance of my target fermentation temperature, and it works perfectly. The freezer rarely activates more than once every 30 minutes or so, even during primary fermentation. If it is detects a fault, I have it set to disable the freezer so that I do not freeze and destroy my batch of beer and blow up some of the bottles I have stored in there as well. I try to check on it everyday just to make sure all is well. The Johnson Controls Digital Temperature Controller has met and exceeded all of my expectations, and I give it a 5 out of 5 stars review. Photo #2 of the Johnson Controls Digital Temperature controller being run into my fermentation freezer where it is attached to one of the glass carboys to regulate the temperature of the fermentation. Kegs are cylindrical beer storage vessels that are typically constructed out of stainless steel or aluminum. They come in a variety of sizes from 2 gallons all the way up to a full size 1/2 barrel keg at 15.5 gallons. I like to consider a keg to be a home brewer’s best friend. The primary benefit of a keg over bottles is the convenience. There is only one container to clean, sanitize, fill and carbonate; kegs are also very durable and allow you to modify your carbonation level if desired. 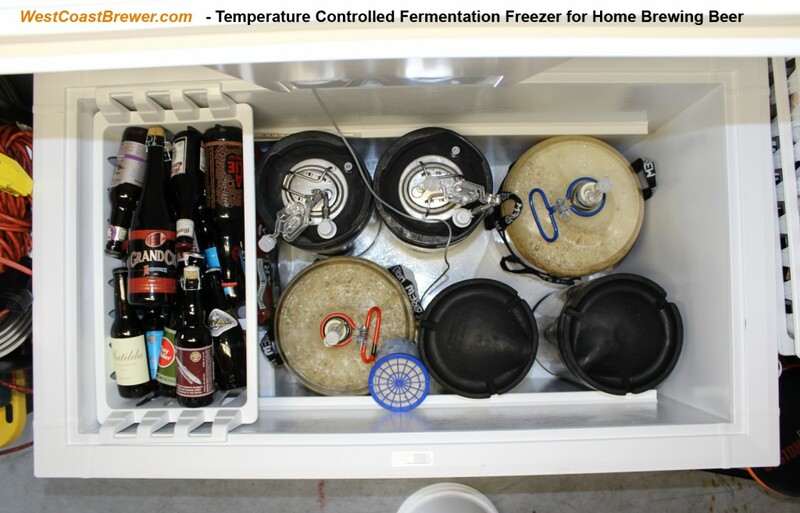 Most home brewers use a version of a 5 gallon keg known as a corny keg or Cornelius keg. 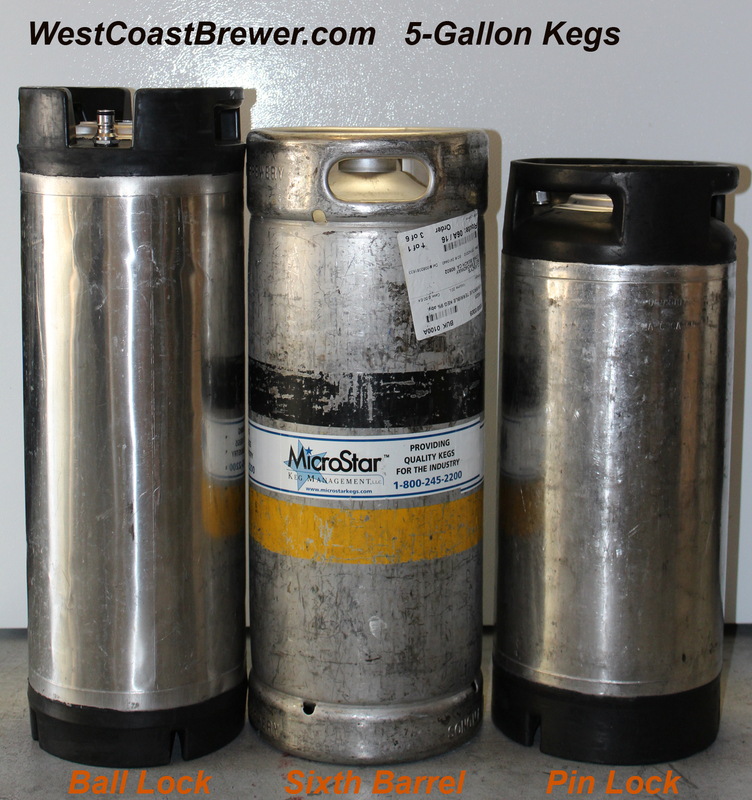 Below is a photo of three varieties of 5 gallon kegs. On the left is a 5 gallon ball lock Cornelius keg, in the center is a 1/6th barrel keg (that you would typically receive from a large scale or craft brewery) and to the right is a pin lock conversion keg; all hold approximately 5 gallons of beer. The ball lock kegs tend to be most common and prized by home brewers. I personally use both ball lock and pin lock kegs that have been converted to ball lock so that they are compatible with my CO2 system. I use my pin lock conversion kegs as fermentation vessels in my temperature controlled fermentation freezer. The pin lock kegs are shorter and wider which allows me to fit them in my fermentation freezer without the need of a collar extension for the freezer. Special air locks are available for use with the keg-style fermenters; I only use them as a secondary fermenter due to the reduced head space available for the foam created during primary fermentation. Below are three varieties of 5 gallon kegs. Different types of 5 gallon beer kegs.